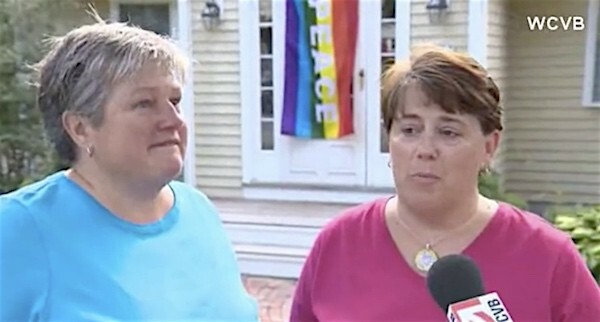 Lauri and Cari Ryding have lived in Natick, Massachusetts a suburb just 10 miles west of Boston, for 23 years. After the Pulse nightclub massacre happened on June 12 in Orlando, the couple decided they would put up a Pride flag in solidarity with the victims. They then went away on vacation. When they returned, they discovered that their Pride flag had been stolen and their house had been pelted with eggs. The incident was disconcerting to say the least. “It really is hard to feel someone hates you,” Cari told WCVB. “It really sent us reeling,” Cari said. But what happened next reminded the couple why they loved the neighborhood in the first place. On Sunday, a squadron of children on bicycles delivered rainbow flags to house after house. And one by one, the flags went up, transforming a swath of suburbia – more than 40 houses in all — into a brilliantly colored declaration of pride and solidarity, displayed on picket fences, garages, doorways, and decks. More than 2/3 of homes in the neighborhood now bear a rainbow-colored Pride flag in solidarity with the Rydings.